Here's a call-out to all to help make the best Bandit Wiki on the net. I'm currently concentrating on just the spec sheets, and would like for you guys to check my work and make any corrections and/or fill in blanks. 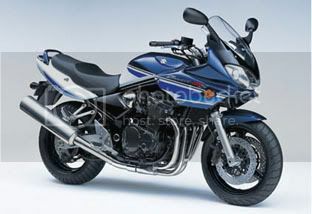 I especially need some help with both versions of the B650 as well as the new 1250. Re: Help us build the best Bandit Wiki! gets a starting frame number of JS1GV79B62100001. As an aside you may want to include manufacturers of brake systems since you've mentioned the fork and shock manufacturers. Oh, BTW, the rear brake is listed as a SINGLE piston caliper...and, sho 'nuff, the exploded view shows only one piston. from Suzuki Canada issued Aug 2005. If I find anything else, I'll pass it along. Ignorance is curable. Stupidity is terminal. The model designators like GV79A are also used in Japan, from what I can gather from all the older Suzuki models, not just Bandits. I was listing caliper brands on ones I could find, but I didn't find anything for the 3G & 4G. (Don't have caliper brands for the 250/400's either... hoping someone comes up with those for us.) I hadn't found braking specifics for the latest models, such as what you give, anywhere, so I had assumed the rear brake to be carried over, since the 600 & 1200 had been using the same rear brake since day one (with the exception of the 1G 1200 w/ABS). Thanks for the correction!! That sort of thing is exactly why I asked for you guys to help out. This statement confused me a little... in your opinion it really is what? A 2.5G or a 3G? 1) Previous models changed generation when they changed looks. This seems to be standard not just with Bandits, but thoughout the m/c community on long running models. Following this standard, the '06 B12 & '05-'06 650 models are 3Gs. 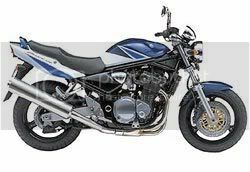 Had the water-cooled bikes never exisited, there would be no argument that it is the 3rd generation Bandit. In fact, when our first B650 members showed up, that's what we started calling it. 2) Even though the water-cooled models have the same bodywork as their previous model year predicessors, a change this big seems to warrant a new moniker to me. Quickly, off the top of my head, I can't think of any other bike models out there that have made a big change like this and kept the look of the previous one and not be considered a new generation. (I can't even think of a bike at the moment that's made a major engine change and NOT changed the styling.) At a minimum, I felt the '07's would be a 3.5G, not the '06 (and '05 650) models as 2.5G. 3) When I first started putting info into the wiki, I was calling them Air/Oil-Cooled and Water-Cooled 3G's. While searching various sources for specs and details, I revisited BanditMania. On their front page, they have a brief section at the bottom on how to ID the bigger Bandits. They call them Mark 1, 2, 3, 4. This was the kicker for me. If the water-cooled powerplant change was enough for them to separate the '07 from the '06 with a whole number, it's good enough for me and it sealed my decision on this somewhat controversial topic. No! It's OUR Wiki! That's why I'm asking all of you for help. I'm just inputting data. If it needs corrections, great! Perhaps I should put in footnotes over the whole 2.5/3.5G thing? for the info! I'll get it incorporated right away! Seems odd that the '06 appears to use the same tank (30 mm shorter than the 2G) as the '07-up models and American, Canadian & UK Suzuki's spec sheets list fuel capacity for them ('07's) at 19L... but searching out spec sheets for the '05 & '06 650 & '06 1200 do list capacity as 20L... where'd the liter dissappear to? Perhaps more expansion space, like the CA models of the 2G? Previous models changed generation when they changed looks. This seems to be standard not just with Bandits, but thoughout the m/c community on long running models. You ought to be OK, you can get powertrain parts from the 1G & 2G and everything else from the 3G & 4G. Remember, the 3G 650 is a two year deal and shares bodywork... ooooh! 2000 B12S "Good Ole Bob"
Sure, I'll consider it, the text still has a ways to go, but remember, that paint scheme first appeared in 2004 in Europe. ....but remember, that paint scheme first appeared in 2004 in Europe. Fantastic job of gather specs Paul!! - there's still some blanks to fill in and some model's enties could use more detail... hence the request for help. Otherwise from those two kvetches, the whole Wiki is shaping up nicely. Thanks for all your hard work on this. A great reference for ALL of us.....vets and newbys alike. Thanks, Rick! Any idea if the 1250 comes with adjustable bars then? C'mon, 1250 owners, go out and take a look. Excellent job and very comprehensive and informative. However I do think your description of the 4th gen B1250 is too simplistic and over summarized in recognizing the B1250's well publicized changes, advances, improvements and unprecedented popularity IMO. Although the picture you chose is worthy of the bike +1.